My easy eggplant parmigiana appetizers are full of buttery Parmesan flavours and perfectly matched with fresh basil, buffalo mozzarella and sour cream. 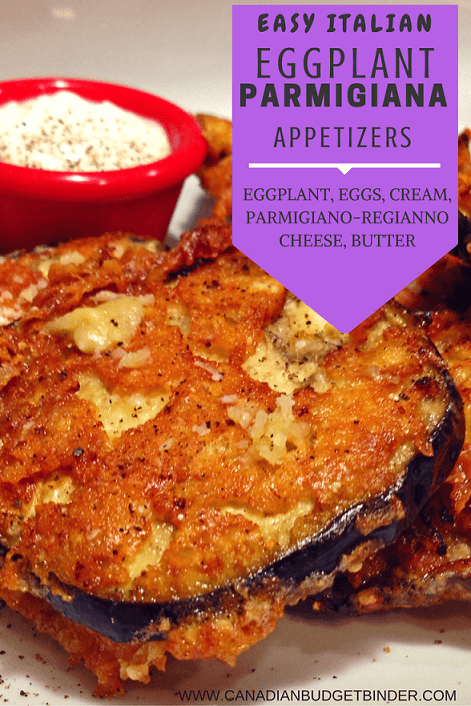 For anyone who is on a low-carb diet these eggplant parmigiana appetizers must end up on your weekly menu plan. Not only are eggplants budget-friendly but this recipe quick to make when you’re in a rush or have unannounced company. When you are cooking two different types of meal plans like in our house delicious, quick recipes are welcomed. Unless eggplant is a staple in your diet most people turn their noses up at it. Lack of understanding about cooking eggplant may push people away. Eggplant is unique for its awkward egg shape, deep purple colour. Eggplant is spongy and soaks up flavours which you will want to add to your eggplant dishes. I had no idea how to cook eggplant nor did I have any eggplant recipes under my belt. I was shown how to make eggplant parmigiana for a dinner party a few years back by my father-in-law. Italian eggplant dishes revolve around casserole creations such as breaded, fried eggplant smothered in pasta sauce and Parmigiano Regianno cheese. This is the classic eggplant parmigiana dish also known by Italians as Parmigiana Di Melanzane. You either love it or hate it and I’ve turned it into an appetizer. Last week I was staring at the massive bin of eggplants, peppers and zucchini sitting in our kitchen wondering what eggplant dishes I could create. I was specifically focusing on eggplant pasta or some sort of eggplant appetizers. This summer the in-laws shared their huge eggplant harvest with us along with just about every other vegetable you can think of. We couldn’t say no to their gracious offerings because I know that buying organic products at the farm or grocery store can be costly. Besides growing eggplant their garden is filled with loads of fruits and vegetables for the entire family. They also give lots of their produce away to friends and neighbours. When you’re retired and gardening is your passion you can become somewhat obsessed with watching your garden grow like they do. Cooking eggplant is fairly straight-forward as long as you remember to add flavour. The eggplant parmigiana appetizers ingredient list is small but powerful with the pungent flavours of Parmigiano Regianno and butter. Fried eggplant in butter on medium-high creates a crispy exterior and a soft inside which makes this dish the perfect appetizer. You can enjoy these medallions as a finger-food with a dipping sauce of sour-cream, ranch dressing or tomato sauce. I took it one step further and layered the medallions with organic vegetables and cheese. Drizzle with a bit of olive oil. Dip your eggplant into the egg mixture and then into the fresh grated cheese and fry them in the butter. It’s very important to cool them on a rack right after you take them from the frying-pan. 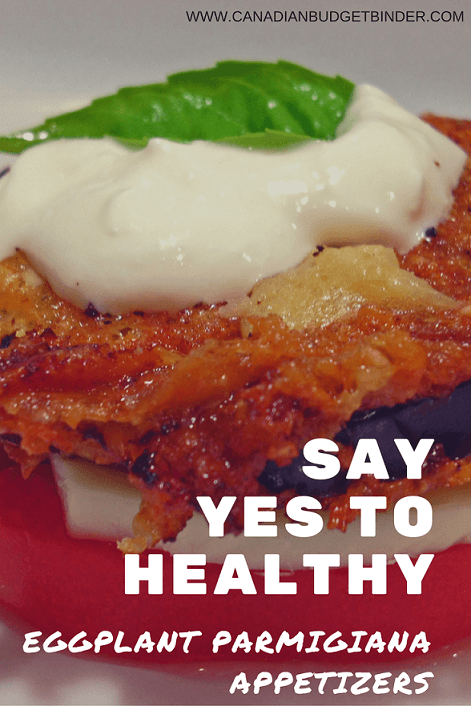 You will want to keep the eggplant parmigiana medallions very crispy so give them time to rest a bit. If you place the eggplant parmigiana rounds on a plate they will get soggy underneath. The eggplant parmigiana appetizers fry quickly at about 3-4 minutes per side. Depending on how large your frying pan is you can cook many or a few at a time. I tend not to crowd them when frying so they have room to crisp up and the temperature of the pan isn’t reduced. If you crowd your frying pan you may also find that they won’t cook up as crispy or they soak up too much of the butter. What I like to do is a test appetizer which means I get to eat one first. This way you will know what temperature to set your stove-top at to give you ideal crispness. Italian eggplant makes a wonderful appetizer when fried or added to any type of casserole type dish. Add your eggplant medallion to the egg mixture then into the cheese. Make sure that your eggplant is covered in cheese on both sides even if you have to pack it on with your fingers. Put the eggplant into your frying pan and let them fry without trying to turn them often. I try to flip them once per side. Have a look underneath to see when they are golden brown and then flip. This takes me about 3-4 minutes. Make sure you have enough butter to fry them in or they will burn. Once done put them on a wire rack to cool a bit before serving. Serve with pasta sauce, ranch dressing, sour-cream or any other dipping sauce that you enjoy. 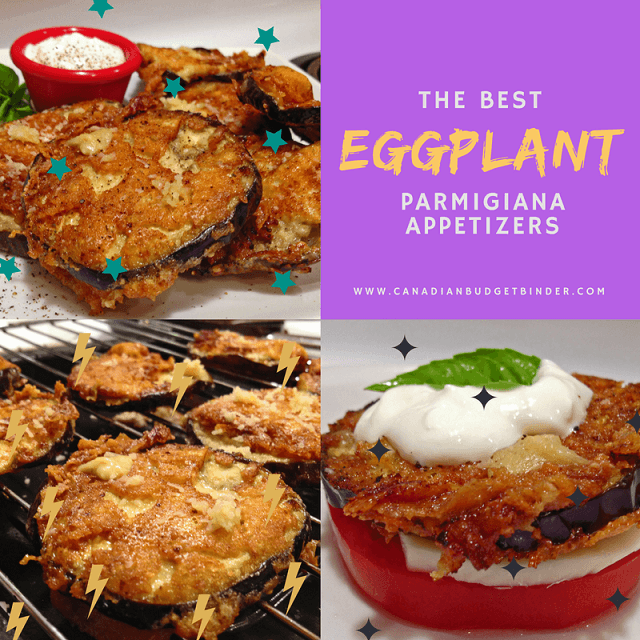 I’m sure this won’t be the last eggplant recipe that graces the pages of this blog but for now I’m going to enjoy how delicious these eggplant parmigiana appetizers turned out. What eggplant recipes do you make? I love it and you know these are dead easy to make as an appetizer version.